Cindy deRosier: My Creative Life: 8 Years of Blogging! April 4 is a big day for me. It ranks up there with the day I was born (March 12), the day Steve and I got married (May 30), and the day Trevor was born (June 7). Eight years ago today, I started My Creative Life with this post. It's hard for me to wrap my head around that. I've posted an average of 261 times per year, which is equal to the number of weekdays per year. I'm proud of that. It hasn't been easy, but it's been so worth it. I've never considered quitting, not even once, but I have thought about taking more breaks, dropping back from my 5 day/week posting schedule, or re-running old posts. Whenever I've debated doing one or more of those, I've decided against it. 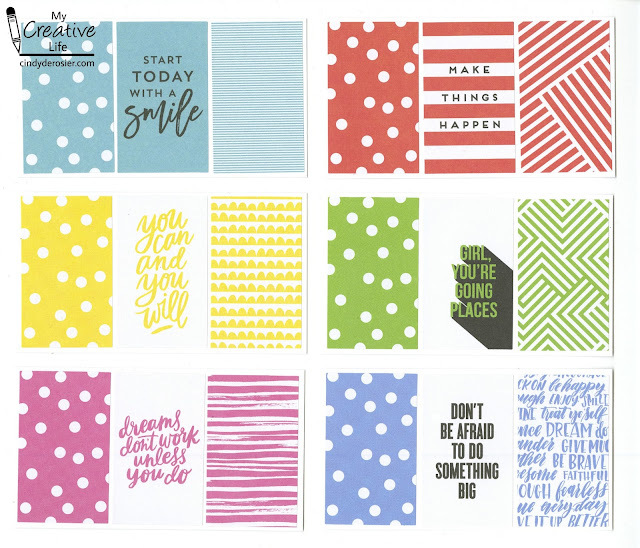 I recently made some inspirational cards for myself and thought the anniversary of my blog would be the perfect time to share them. All the stickers come from the fabulous Create 365 'Get It Done' Value Pack (affiliate link). Simply stick them on white cardstock and then trim. Thank you to all my readers and everyone who supports my creative life. You make everything I do worth it. Congrats on that great milestone! Unlike you, I've cut down on posts and I've debated many times on quitting.Haha.